Show and Tell Meg: My Filippo Berio Bzz Kit Is Here! My Filippo Berio Bzz Kit Is Here! 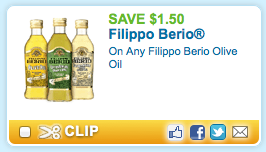 If you would like to try this brand out for yourself, you are in luck because this morning Coupons.com has released a new one this morning for $1.50 off Filippo Berio Olive Oil. So, go here (use zip code 77477 if you need to) and print it out for yourself. This is a higher value coupon then what I was given in the kit, so it's a great opportunity to give it a try. Thank you BzzAgent for sending me all this cool stuff and I can't wait to try it all out :) Check back later for my review!